What will the web browser of the future look like? Microsoft has tried to make a raft of changes with its Edge browser that comes with Windows 10, but Opera has taken innovation to a different level with its new browser: Neon. 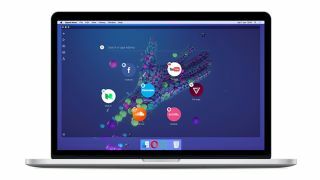 Neon is classed as a concept browser, built with the same Blink engine as the standard Opera browser, but with a totally different look and a host of experimental features. Instead of your usual browser UI with the address bar and tabs right at the top of the screen in a traditional window, Neon plays things far faster and looser with a homepage that has website favourites encased in bubbles that simply float above your desktop wallpaper, with the URL bar hovering above them. Open tabs also appear as bubbles vertically down the right-hand side of the screen, inlaid with images to give you a visual clue as to what site is open in the tab. These bubbles can be dragged around with your mouse, and have a real weight to them with Neon having a physics engine. And a ‘gravity’ system which means that your most-used tabs are automatically put in a more prominent position in Opera’s speed dial. Then there are features like snap-to-gallery, which lets you draw a crop box around any image (or part of an image) on a web page, copying it directly so you can easily paste it into, say, a Facebook chat (and the image automatically has its web address linked to it, so you can easily go back and find the site where it came from at a later date). The browser also lets you pop videos out from a site into their own window, which you can easily adjust the size of or shift around, and there’s a ‘player panel’ that displays all the tabs playing music or video so you can swiftly access media-related content. Neon also benefits from a split-screen mode, which lets you interact with two websites simultaneously side-by-side. You can download the browser and try it out on Windows now – grab it here – but bear in mind this is a piece of concept software, and not intended to be used as your full-time browser. However, some of the features debuted in Neon will be coming to the main Opera browser, starting as soon as this spring.